Omega One Small Marine Pellets with Garlic Fish Food are crafted from three primary ingredients: seafood, spirulina, and garlic. The recipe also includes vitamins, such as biotin. All of these ingredients are of the highest quality. While seafood and spirulina make up the bulk, garlic is a strong presence in the pellets as well, to enhance the taste. The result is a marine fish food that is packed with benefits, and delicious to fish, too. As with all pets foods, many fish food companies opt for starchy fillers in their recipes. Outstandingly, Omega One Small Marine Pellets with Garlic Fish Food are instead made from fresh seafood directly. This means no pre-processed proteins or meals are added. Seafood contains pure, whole proteins, and Omega-Fatty acids. Both of these things are mandatory when it comes to creating the perfect diet for your marine pets. The seafood utilized is even obtained from sustainable fisheries, making it a great way to show your fish and fish in the wild alike some love. Salmon skin contains beta carotenes. These are renowned for their ability to enhance the color and vibrancy of fish scales. This means that, not only will your fish feel better with Omega One Fish Food, they will look better as well. Salmon skin is but one of the naturally occurring pigments in this fish food. There are many others, too, all of which will contribute to your fish’s health and beauty. Fish can be delicate creatures, with sometimes delicate health. One of the biggest threats to fish of all sorts is a dirty tank. Food is one of the main culprits of this. Some fish foods dissolve quickly, and can even contain ash, both of which contribute to a dirty tank. Alternately, Omega One Small Marine Pellets are insoluble and contain very little ash. This makes cleanup after mealtime easier and more effective. Uneaten food is one of the main causes of poor water quality in beginners fish tanks. For a complete guide to keeping and setting up a new aquarium read our complete guide to starting a new aquarium. Of course, the healthiest fish food in the world will do little good if fish will not eat it. Garlic very appealing to fish, and as a bonus, helps them with resistance against nasty parasites. The garlic flavoring has earned Omega One Small Marine Pellets with Garlic Fish Food great popularity among marine fish of all sorts. It makes sense, then, that Omega One Fish Food are a great choice for fish that are picky eaters. The garlic-infused recipe is said to be virtually irresistible to saltwater fish. Seafood is an excellent source of Omega-Fatty acids. Healthy fats like this are key to helping fish ingest enough calories and maintain a healthy weight. Perhaps even more importantly, Omega-Fatty acids support fish’s immune systems. As aforementioned, fish are sensitive creatures. They are prone to a variety of ailments. While there are many steps which can be taken to safeguard the health of your fish, feeding them a Omega-Fatty acid rich diet is one of the most effective countermeasures out there. Indeed, Omega-Fatty acids are one of the best aids, ultimately, in helping fish live long lives. Omega One Small Marine Pellets are known as sinking pellets, meaning that they will swiftly pass to the bottom of the tank. This makes them ideal for bottom-dwellers, and especially shy fish that might not get enough to eat otherwise. Simply scattering the pellets (as directed) in the water should be enough to make them sink. Should you wish them to sink further, drop them into the water with more momentum. When tidying up after meals, do not forget any leftover bits that may be lingering among sand or pebbles at the bottom of the tank. The spirulina in this recipe was harvested by hand. With its enormous protein content, it serves both as greens (energy and vitamins), and muscular-support and the like. Spirulina has also been shown to have significant anti-viral properties. The beneficial plant strengthens fish’s overall immune systems (even to the extent of fighting off cancer). Another great food for saltwater fish is seaweed. This food is essential for many saltwater fish to ensure they are receiving a balanced diet. Picky eaters like Tangs, Angelfish, Butterflyfish and Moorish Idols love to eat this food. We feed ours OmegaOne Veggie Seaweed Strips. We hold our strips in place using a saltwater suitable seaweed clip like the one above. It’s saltwater safe and holds the strips inplace whilst your fish nip and pull at it which prevents it from getting sucked into your filter system. If you are looking for a saltwater fish food that is of the optimum quality and palatability both, look no more. 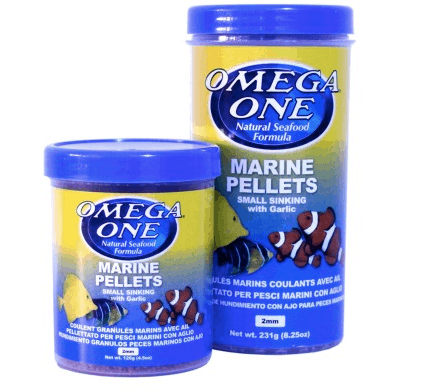 Buy Omega One Marine Pellets Here. Very few pet foods these days can boast of a recipe free of pre-processed proteins and meals. Even less are able to obtain the ingredients sustainably. With Omega One Small Marine Pellets with Garlic Fish Food, your fish will find all of their protein requirements met, along with ingesting plenty of Omega-Fatty acids. The immune-system boosting formula will help your fish achieve a long life. The beta carotene and other scale and color beautifying-pigments will let them do so in style. Last but not least, fish really adore the taste, making it a winner for fish owners and fish alike. Stephanie is a writer of both non-fiction and fantasy. She also loves to spend time out in nature, lift at the gym/box, draw, write poetry, and bake.